Arlyn is an eccentric fiery-redhead with a dreamy disposition and a propensity to put too much faith in her own naive version of destiny. Sitting on her porch after the death of her father, she declares that the next man she meets will be the one she marries. And lucky for him, John Moody (whose name doesn't quite escape his brooding nature) turns up asking for directions on his way to a party. He is the polar opposite of Arlyn--stern, driven, and rational--so of course, they get married and settle down in glass house in Connecticut where Arlyn gives birth to their son, Sam. Ironically, the "Glass Slipper," as the house is called, gives Alryn the opposite feeling of openness, and it soon becomes clear to her that their youthful passions and her misguided trust in fate has trapped her and her odd son in a glass cage with a loveless marriage. 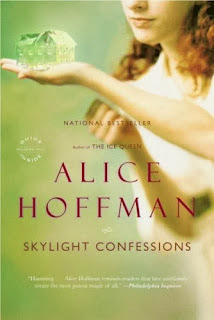 Dwelling in the realm of magical-meladrama, Skylight Confessions is split up into three parts with 3 different narrators. Jump about 15 years into the future to Part II: through the eyes of the baby-sitter, we meet the lovable Bianca Moody, John Moody's youngest child, who is devoted to her drug-addicted teenage brother. Perhaps the most tragic character in the novel, Sam struggles with the death of his mother at his sister's birth and the never-fading feeling that his father never wanted him. As his warm and compassionate sister struggles to hold the family together, Sam draws further into himself, using drugs to escape the emotional imprisonment of his father's house. And while John Moody can't shake the intense feeling of regret that has haunted him for so long, nor can he seem to shake the ghost of his deceased wife, finding himself dreaming about her fiery-red hair. Secrets come out, and John has to face his life and the lives of his children. So an interesting theme throughout the novel is, of course, the unescapable emotional repercussions of regret, and the idea that you would do things over if you could. But more than two people are affected by the happenings of that fated night long ago, and reader is left wondering what can possibly make things right. There's something so tragic about each character, and as I kept reading, I found myself more unexplainably invested in their lives. The way she writes, Hoffman gives you the sense that you are about to enter into a fairy-tale, and then she impales you with the harsh realities of rash, whimsical decision-making, leaving you with a haunting feeling that you won't quite be able to shake. The novel ends when a grown-up Bianca fills in the pieces of the Glass Slipper, but it makes you think differently about what it means to be a family. I'm not quite sure if I'm relieved or heartbroken by the way things end, and that's kind of the way this book makes you feel. Haunted. If you like stories about dysfunctional families, affairs, ghosts, tragic fairytales, and books that leave you with a feeling rather than a "message," than read this book. Use this link to support the Lone Book Club! ...Welp, this is going on my to-read list. Wonderful review!